A four-day siege at a gas facility in the Sahara desert has ended, with militants and some hostages killed. Seven hostages were killed by their captors during a final raid by Algerian troops - at least 23 hostages and 32 hostage-takers died in the four-day stand-off, Algerian officials say. Five Britons are feared dead or missing - five Norwegians are unaccounted for. US President Barack Obama said blame for the violent outcome rested with the "terrorists" behind the attack. "We will continue to work closely with all of our partners to combat the scourge of terrorism in the region," said Mr Obama. His defence secretary, Leon Panetta, earlier told the BBC the US would go after al-Qaeda wherever they tried to hide. French President Francois Hollande defended the Algerian response to the crisis as being "the most suitable". "When you have people taken hostage in such large numbers by terrorists with such cold determination and ready to kill those hostages - as they did - Algeria has an approach which to me, as I see it, is the most appropriate because there could be no negotiation," he told journalists. UK Prime Minister David Cameron said that "one British citizen has already been killed in this brutal attack and we now fear the worst for the lives of five others who are not yet accounted for". "There is no justification for taking innocent life in this way. Our determination is stronger than ever to work with allies right around the world to root out and defeat this terrorist scourge and those who encourage it," Mr Cameron said. Media captionWilliam Hague: "Our focus is on getting British nationals who have survived this ordeal back to the UK"
The In Amenas gas field is situated at Tigantourine, about 40km (25 miles) south-west of the town of In Amenas and 1,300km (800 miles) south-east of Algiers. The plant is jointly run by BP, Norway's Statoil and Algeria's state-owned oil company. The militants had been involved in a stand-off since Thursday after trying to occupy the remote site. Details are still sketchy, but unconfirmed reports say the hostage-takers summarily killed the remaining seven hostages before themselves being killed in a final army raid. Citing a provisional total from the interior ministry, state news agency APS said 685 Algerian workers and 107 out of 132 foreigners working at the plant had been freed. At least 23 hostages are known to have died, but the nationalities of some are still not known. With 14 Japanese nationals thought to be missing, Prime Minister Shinzo Abe said he had received "severe information" about the fate of the hostages. The chief executive of BP group said 14 of its 18 staff were safe - the company had "grave fears" for the other four. Helge Lund, chief executive of Norway's Statoil, said the company was still missing five workers and feared "bad news", Reuters news agency reported. Algerian national oil and gas company Sonatrach said the army was now clearing mines planted by the militants. Weapons allegedly seized from the kidnappers were shown on Algerian TV. Media captionUS Defence Secretary Leon Panetta: "We cannot accept attacks against our citizens abroad"
The crisis began on Wednesday when militants attacked two buses carrying foreign workers. A Briton and an Algerian reportedly died in the incident. The militants then took Algerians and expatriates hostage at the complex. The leader of the hostage-takers is said to be a veteran fighter from Niger, named as Abdul Rahman al-Nigeri by the Mauritanian news agency ANI, which has been in contact with the militants. 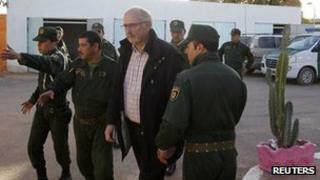 The Algerian armed forces attacked on Thursday as militants tried to move some of their captives from the facility. APS reported before Saturday's raid that a group of militants remained at the site, holed up in a workshop with the remaining hostages and armed with rocket-launchers and machine guns. A statement from the kidnappers said the assault on the gas plant was launched in retaliation for French intervention against Islamist groups in neighbouring Mali. Final assault: The Algerians ended the raid on 19 January, killing the last 11 captors after they had killed seven hostages, state media reported. Twenty-three hostages and 32 militants in total are now known to have died.